Sep 11, 2017: the definitive Diada? Sep 11, 2017: the definitive Diada? Arxiu. October 1, 2017 could well turn out to be the most important date of the year in Catalonia, if the independence referendum promised by the Catalan government goes ahead. Yet, before that, another –equally important– date come first: September 11. Naturally, Catalonia’s national day has always been important for the country, but in the past few years it has taken on extra significance. Ever since almost two million people spontaneously took to the streets of Barcelona on September 11 2012 to call for self-determination, the Diada –as the national day is called– has become a rallying point for a country determined to have its say about its political future at the ballot box. Each September 11 in the past few years has had a focus, to foster unity and participation while attracting media attention. In previous years, we have seen such things as a human chain across the country, or a huge V-sign that could be seen from the air, formed by demonstrators in the centre of Barcelona. This year, just two weeks before the referendum, participants in the demonstration to take place in central Barcelona will at a given moment remove their tops to reveal the 2017 protest t-shirt, thereby creating a florescent yellow wave describing a huge plus sign. 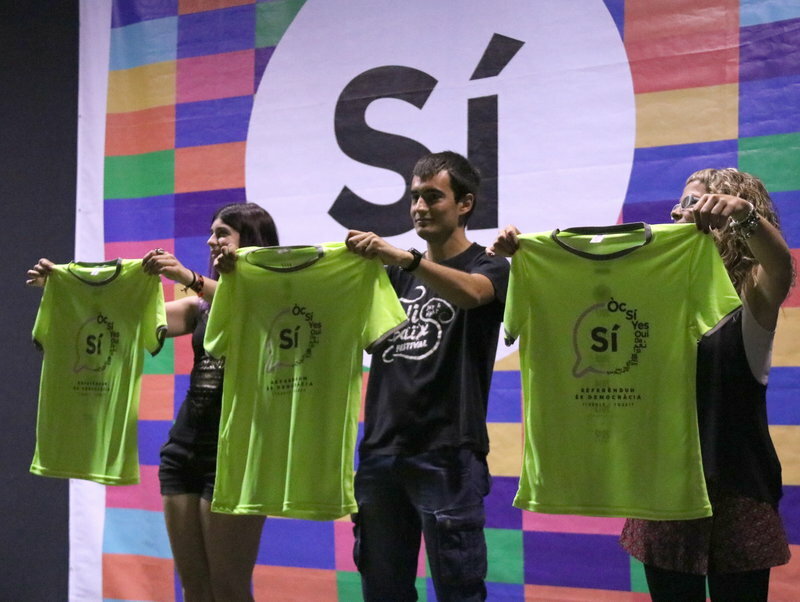 The t-shirts, which were presented at the end of June (see picture), were inspired by the fluorescent yellow tabards worn by the volunteers who every year make the event possible. The t-shirts, which have a large ’Sí’ on the front, encouraging people to vote yes in the referendum, are available at the Catalan National Assembly website shop: botiga.assemblea.cat, and cost 15 euros for adult sizes and 8 euros for children’s sizes. Don’t go to the demo without one!